From release: As an original and founding member of Slayer, Lombardo has performed with Slayer on seven albums, including their ground-breaking 1986 release Reign in Blood and their 2006 release Christ Illusion, for which he received critical praise. Dave’s musical career has spanned more than 30 years, during which he has been involved in the production of 30 commercial recordings spanning a number of major genres with bands such as Fantômas, Grip Inc, Testament, John Zorn and PHILM, in addition to Slayer. Lombardo’s most recent endeavours have found him in a variety of compelling adventures. You’re heading to Australia for some clinics which is pretty cool, now for someone who has never been to one of these, what can we expect at these upcoming shows? Well it starts off with a drum solo, and then what I’ll do is a series of drum solos and play alongs I usually get on the microphone and start chatting with the fans, with the drummers out there and we discuss techniques and approach and everything from different styles of music to listen to to become inspired, to different drums. 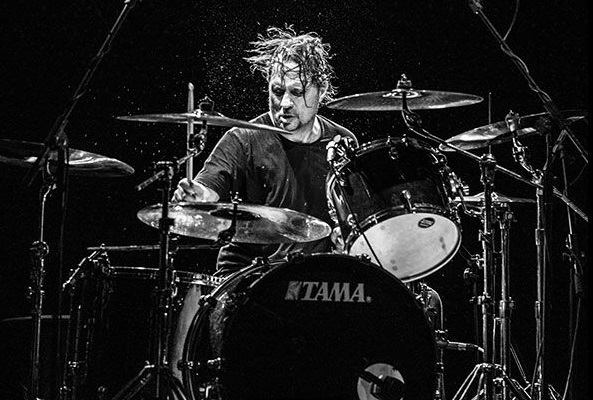 It’s basically one on one with Dave Lombardo, you get to sit there with me and we basically have a conversation but it’s in a large forum with a lot of people. So it’s fun, I enjoy doing it. This is a little different from your past times here, but besides the clinics, what are you most looking forward to about heading down here? Oh man, everything *laughs* it’s always exciting going Down Under, it’s just amazing. I look at Australia as like California on steroids *laughs* you guys really love the outdoors and people are great, food is amazing and it’s definitely an experience. Well, the ride cymbal is a replica of the ride cymbal I used during ‘Reign In Blood’, I recently discovered the cymbal, I thought I had somehow lost it, or it was stolen in one of the burglaries that’s happened to me throughout my career, but I thought I lost it. So when I discovered it I presented it to Paiste cymbals to Erik Paiste and we decided to put these in production and it has a little bit of my influence and of course I titled it and designed the logo, it’s got my touch and of course my stamp of approval. Can you tell us about your Rhythm Mysterium Art Collection and how you got involved with the idea? I’ve always been a fan of art and I’ve been to many museums throughout my travels in places I’ve been to, so art has always been something I’m really interested in and enjoy observing, just looking at and studying, So when this company called SceneFour approached me with the idea of creating these pieces through photography and computer manipulation, colours, I said as long as it has my touch and what I would like and what I would like to see then I would like to be a part of it and they obviously agreed, they liked their people to be a part of it, so I was able to choose everything from the pictures to the colours, the titles of the artwork, everything. It was a lot of fun to do, it was really exciting to see how it all came together as an experience, and I would love to do it again but probably in a whole different medium. Who knows? I get tired sometimes just watching you drumming, what’s your secret to being able to keep up the pace? Well when you watch those videos I’ve been conditioned, I condition about a week prior to say the Slayer tours, if we had two months off I would probably condition a week to two weeks prior and that would be driving probably five times a week to rehearsal and just going through the set because you need to build up stamina, so that when you hit the stage you don’t pass out from exhaustion, you have to build yourself up to it. So I try to get as many rehearsals in with the band and it’s not really to rehearse our chops, it’s to build up your energy running through the set, just ridding yourself from the cobwebs *laughs* you have to try to just get yourself into a condition to perform live. What you see if someone that’s been working for a while. Yeah, I don’t have any problems with my joints or anything like that thank God I’ve been free from any kind of pain, knock on wood, but I attribute that to something I touch on when I talk to the fans at these drum clinics and workshops, I teach them how the drums I feel should be set up and feel comfortable, nothing should feel out of place. If there’s a cymbal that is six feet off the ground and you’re sitting fairly low you’re gonna put some strain on that shoulder because you have to reach up at that cymbal, probably a hundred times a night and multiply that by a tour, let’s say you do twenty shows a tour, it’s gonna cause some damage so you’ve got to be conscious of these things when you’re setting up your drum sets, but I haven’t had any issues. Band wise you’re with Philm, what’s being in this band allowed you to do that you felt you weren’t able to in bands like Slayer or Fantomas? Wow, Philm is to me like absolute musical freedom, although there’s a lot of freedom in Phantomas and working with John Zorn and Bill Laslo with Blade Runner that’s improvisation, that’s a different animal. Then Phantomas is very complex, very mental and you have to really think about these parts and you have to count and Patton writes all the material. With Philm when we write we press record on a computer system we start improvising and we come up with these amazing patterns and these amazing little gems of music that only happen and are captured when you press record, then what we do is we take those little gems and we create more bodies of music around that idea. So this band, the music is created in a very organic way, I don’t like using that term often but it’s very natural. With your second album out this time last year, what’s next for Philm? Well we’re working on our third album, that one is going to be released early next year, as soon as possible, but it’s going to be produced by Ross Robinson, he’s going to help us out with this album, I’ve worked with him a couple of times before and we’re friends and he likes the band, so I decided to hand over the producer role to him whom I trust. You’ve also taken on producing duties in the past, is it hard to put on a producer hat when you’re so used to your performer hat? It’s like a fine line and you want to differentiate, you want to step away from being the musician or the artist and know that what you’re doing is for the better of the record, to make the album sound better or the structure of the songs, so if there’s something that I would feel personally as the drummer, say this particular drum beat feels good, then I step away and I listen to the comments of the other musicians and then I put myself in the place of a producer and it’s like, ok, as a whole does it make the song better? So I kind of have to make that decision, it’s difficult but you make it work and I think part of being a producer is to listen to what all the other musicians have to say, so even though I’m the drummer and of course Dave Lombardo and being the producer, it didn’t mean that I was being some kind of control freak, it was just making sure that we stayed on the path and wanted to make sure that the album was delivered to at least my satisfaction, what I thought the band should be. Aside from the above, you’ve been quite busy since Slayer, primarily working on soundtracks / scores, how does Dave Lombardo get involved in something like that? By chance or it’s where I live… I live here out in LA, and you have friends that work in the film / music industry including Tyler Bates, he’s the composer for ‘Dawn of The Dead’, the 2004 version, that’s where I met him, he hired me to play some drums on that soundtrack and we’ve been friends since then. I think other composers have heard that I enjoy doing that kind of work and recently Joseph Bishara from ‘Insidious 3’ he called me and we had a really great session, I performed with I think two violas, a violin, and a couple of cellos and it was exciting. Now with the Disney soundtrack, that was for a Disney pilot, and unfortunately it didn’t make it, there’s about three hundred pilots a year that go through Disney and only a few get chosen, unfortunately that one didn’t make it, but we had the chance to create music to some animation and working with the Disney team I think was an experience for the band and it really helped us hone in our talents. Are there any other musical adventures you’re working on or heading towards? ‘Reign in Blood’ turns 30 next year, it’s still such a huge record, what’s your best memory of releasing that monster back in 1986? Excitement, we had just gotten picked up by Rick Rubin, I remember going out on tour and us getting our own tour bus, it was amazing, we felt like we made a step in our careers. I just remember a lot of excitement with releasing that album, and I think that album definitely catapulted us to another level and with the help of Rick Rubin that wouldn’t have been able to happen.